Figaro is measuring a space for his nuptial bed while his fiancee, Susanna, tries on her bridal hat. She doesn't like their new bedroom. Figaro doesn't understand why, as it's very convenient to the bedrooms of the Count and Countess. But Susanna warns Figaro that it's too convenient for the Count, who is plotting with her music-master, Don Basilio, to get her to sleep with the Count. Susanna goes off when the Countess rings for her. Alone, Figaro vows revenge ("Se vuol ballare, signor Contino") and storms off in a cold rage. Dr. Bartolo enters with his housekeeper, Marcellina. 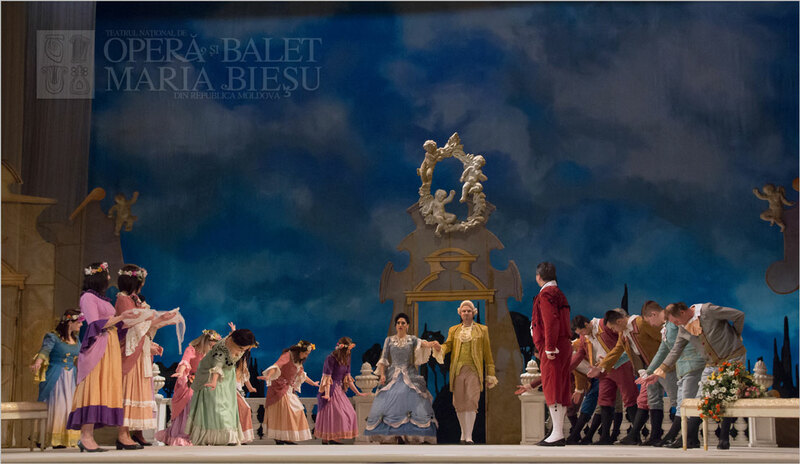 Figaro once promised to marry her, and Bartolo promises to find a way to make him do it. It would be the perfect revenge on Figaro, who blocked his marriage to Rosina. Bartolo goes off to put his scheme into effect. Susanna returns, and Marcellina jealously spars with her, making Marcellina go off in a huff. The teenaged page Cherubino now enters. He tells Susanna that he is in love with the Countess, but the Count has caught him with young Barbarina (Susanna's cousin and the gardener Antonio's daughter). Cherubino can't contain his romantic desires ("Non so piщ cosa son, cosa faccio"). Cherubino hides behind a chair when the Count arrives to beg Susanna for a tryst before he goes to London with Figaro on diplomatic business. But his wooing is interrupted by the arrival of Don Basilio, and it's the Count's turn to hide. He heads for the same chair where Cherubino is hiding, forcing the boy to jump into the seat. Susanna hastily covers him with a cloth. Hearing Basilio's insinuating gossip about Cherubino and the Countess, the jealous Count reveals himself. Basilio of course concludes that the Count and Susanna are an item. This is all too much for Susanna, who begins to faint. The Count and Basilio rush to her aid and try to get her into the chair, but she revives just in time and orders them away. The Count vows to make Cherubino leave the castle. When Susanna expresses sympathy for the boy, the Count tells her that it's not the first time Cherubino has been caught with a female. Recalling how he found the page hiding under a tablecloth in Barbarina's room, he lifts the cloth concealing Cherubino. The Count now accuses Susanna of dallying with the boy. But their argument is interrupted by the arrival of Figaro and a group of peasants, who, at Figaro's instigation, are singing the Count's praises for having abolished the feudal right of the lord of the manor to sleep with his servant's bride. 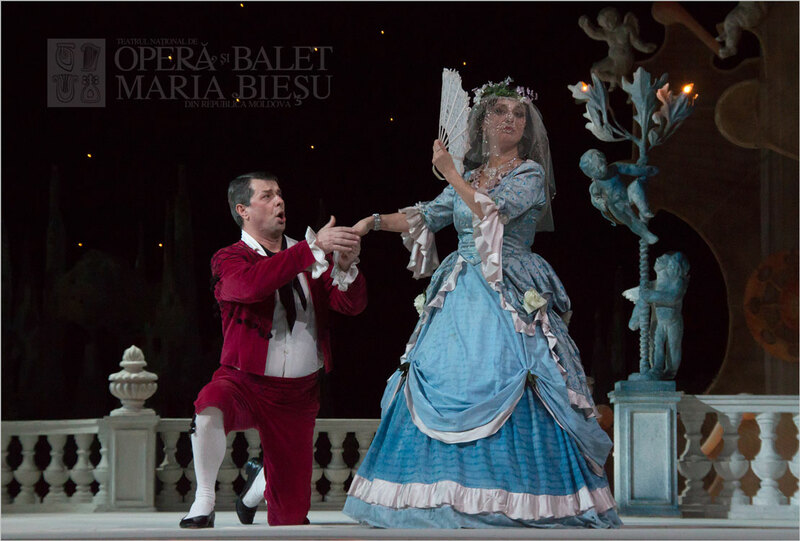 Figaro invites the Count to place the bridal veil on Susanna as a symbol of his blessing on their marriage, which is to take place later that day. The Count is forced to agree, but privately vows to help Marcellina marry Figaro instead. He also gets Cherubino out of the way by drafting him into his regiment. Figaro teases the boy, for he'll have to sacrifice his love-making and enjoy instead the "glories" of war ("Non piu andrai, farfallone amoroso"). In her boudoir, the Countess bemoans the Count's infidelity ("Porgi, amor"). Susanna has told her about the Count's plans to seduce her. Figaro arrives. He knows that the Count is plotting to help Marcellina. He has his own plan: through Basilio, he will send the Count an anonymous note about the Countess's "lover." This is sure to drive him to distraction. Meanwhile, Susanna is to agree to meet the Count in the garden, only it will be Cherubino, disguised as Susanna, he will be wooing. The Countess can then surprise him in flagrante delicto. Figaro goes off to get the boy. Cherubino arrives and, at Susanna's urging, sings the Countess a love song that he wrote for her ("Voi che sapete che cosa и amor"). He shows the Countess his regimental commission, which he had just gotten from Basilio. She and Susanna realize that it has no seal on it. Figaro has told Cherubino of the plan, and Susanna begins to dress the uncomfortable boy as a woman. When she goes into another room to get a ribbon, he takes advantage of her absence to declare his love for the Countess. At that moment, the suspicious Count bangs on the door, and Cherubino dives into the closet. The Count demands to know to whom the Countess was speaking, and she tells him it was Susanna, who has gone into another room. He shows her the anonymous letter that Figaro had written about her "lover." A noise from the closet obliges the Countess to say that Susanna is in there, not in the other room. Susanna re-enters the room, unseen by the Count and Countess, and realizes that there's some kind of problem, so she hides behind a screen. As Cherubino cowers, terrified, in the closet, the Count orders "Susanna" out, but the Countess forbids it. The Count is convinced that the Countess is hiding a lover in there. As they argue, they warn each other not to go too far and create a scandal. Susanna remains behind her screen, horrified by the situation. The Countess absolutely refuses to open the closet, so the Count brings her with him to get something to break the closet open, locking the door behind him. Susanna lets Cherubino out of the closet. In a panic, he escapes through the window, and Susanna hides in the closet. When the Count and Countess return, she finally admits that Cherubino is in the closet, claiming that it was just a joke. He doesn't believe her protestations of innocence and threatens to kill Cherubino. Drawing his sword, he flings open the closet door. They are both astonished to find Susanna. The Count, abashed, is forced to beg his wife's forgiveness. She and Susanna explain that the episode with the closet, and the anonymous note, were all a prank. Figaro arrives to announce that the wedding is about to begin. Questioned by the Count, he denies writing the anonymous note, to the consternation of Susanna and the Countess. The Count is anxious for Marcellina's arrival so he can stop the wedding. Now Antonio the gardener barges in, complaining that someone jumped from the Countess's balcony onto his flower garden. Susanna and the Countess warn Figaro, who had already seen Cherubino jump. He claims that he himself leapt from the balcony. But Antonio claims he saw a boy. The Count immediately realizes that it was Cherubino. Figaro, sticking to his story, claims that Cherubino was on his way to Seville. He explains that he was hiding in the closet waiting for Susanna. After overhearing the Count shouting, he decided to escape by jumping, and injured his foot. He suddenly develops a limp in order to prove his story. But Antonio produces Cherubino's military commission, which he found in the garden. Figaro, confounded, throws the gardener out. Prompted by the women, Figaro triumphantly explains that the page gave it to him because it lacks a seal. 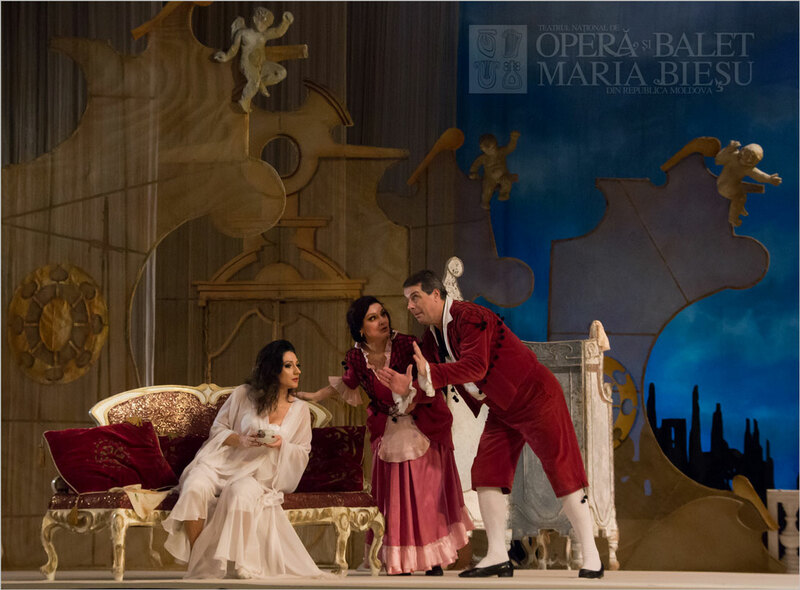 Marcellina, Bartolo, and Basilio now come to demand justice, claiming that Figaro entered into a contract to marry Marcellina in exchange for a loan. The Count agrees to judge the case, to the joy of Marcellina and the consternation of Figaro. Alone, the Count ponders the confusing situation. Unseen by the Count, the Countess urges a reluctant Susanna to go ahead with the plan and tell the Count that she will meet him in the garden later. Because Cherubino is gone, the Countess will impersonate Susanna. The Countess takes herself off. Susanna overhears the Count talking to himself about Figaro marrying Marcellina. Emboldened, she approaches him, claiming that she has come to get some smelling salts for the Countess, who is having a fainting fit. He tells her that she should keep it herself, because she is about to lose her intended husband. She counters that she will repay Marcellina's loan with the dowry the Count had promised her. But the Count claims he can't remember any such promise. She has no choice but to flirt with him, and the pact is made. But as she is leaving, she runs into Figaro, and the Count overhears her saying that they have "won the case." Enraged, the Count threatens to punish them for their betrayal ("Vedrт mentr'io sospiro"). The judge Don Curzio arrives with Marcellina and Bartolo. 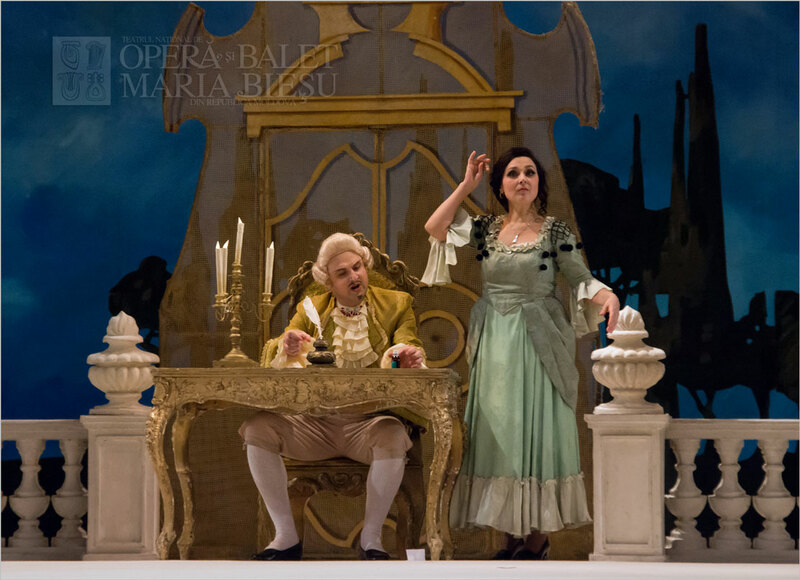 He announces that Figaro must marry Marcellina or repay the loan. Figaro claims that he is of noble birth and cannot marry without his relatives' consent. When the Count asks who they are, Figaro replies that he was stolen as an infant, but hopes to find his parents in 10 years. Bartolo demands proof, so Figaro shows him a birthmark on his arm -- a birthmark that reveals that he is the love-child of Marcellina and Bartolo! The reunited family embrace as the frustrated Count rails against Fate. Meanwhile, Susanna, unaware of this development, arrives with the money to pay Marcellina, only to be enraged by the sight of Figaro and Marcellina fondly embracing. But peace reigns when all is explained to her. The Count storms off with Don Curzio. Bartolo now proposes to Marcellina. Marcellina tears up Figaro's I.O.U. Bartolo gives Figaro and Susanna a dowry, and Susanna adds to it the money she had come in with. The four, chuckling at the Count's frustration, go off to plan a double wedding. The Countess enters, wondering if their plan to catch the Count will work, and recalling sadly the loss of their love ("Dove sono i bei momenti"). After she leaves, Antonio and the Count arrive. Antonio tells the Count that he knows that Cherubino is still in the vicinity, because he found at his house the woman's clothes that Cherubino had been wearing. They run off to look for him. The Countess returns with Susanna, and the two concoct a note, from Susanna to the Count, asking for a meeting in the garden. They seal the note with a pin, which the Count is to return if he agrees to meet her. Barbarina and some peasant girls, including Cherubino in disguise, come to serenade the Countess. Antonio and the Count return to unmask Cherubino. The Count threatens to punish the boy, but Barbarina persuades the Count -- who had once, with kisses, promised her anything she wanted -- to let her marry Cherubino. Figaro arrives, eager for the wedding preparations to begin. The Count begins to cross-examine him again, and Antonio produces Cherubino as proof that they've caught Figaro lying. But Figaro cleverly claims that it's possible that both he and Cherubino jumped into the garden. The wedding march begins, and everyone goes off to get ready, leaving the Count and Countess alone. She refuses to discuss the matter with him. The wedding party returns in procession, singing another paean to the abolition of the feudal right to sleep with the bride. Susanna slips the sealed note to the Count. As the couples dance the fandango, the Count opens the note, pricks his finger on the pin, and then drops it. Figaro watches him with great amusement, believing that it's a love-note from some unknown lady. The Count finds the pin, thrilled at the prospect of meeting Susanna later, invites everyone to magnificent wedding banquet. Barbarina, terribly upset, is searching the garden for something that she has lost ("L'ho perduta, me meschina!"). When Figaro arrives with Marcellina and asks the weeping girl what's wrong, she replies that she has lost the pin that the Count gave her to deliver to Susanna as a token of their tryst. 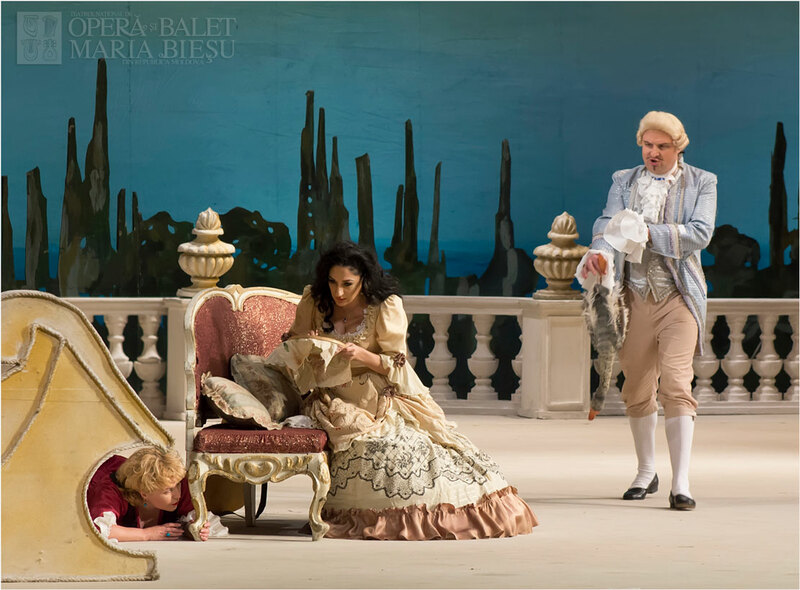 Angry, but pretending that he already knows all about it, he plucks a pin from Marcellina's dress and gives it to Barbarina, who goes off to give it to Susanna. Figaro collapses into his mother's arms. She advises him to stay calm, but rage overtakes him and he vows to avenge all deceived husbands. Marcellina, afraid for Susanna, goes off to warn her. 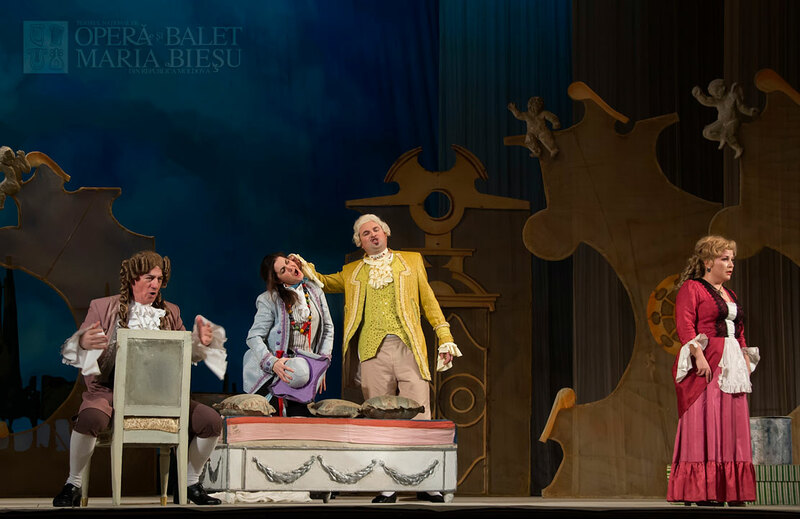 Figaro then enlists Basilio and Bartolo to help trap the lovers. Alone again, he denounces the perfidy of women ("Aprite un po' quegli occhi"). He hides as Susanna arrives, accompanied by Marcellina and the Countess. 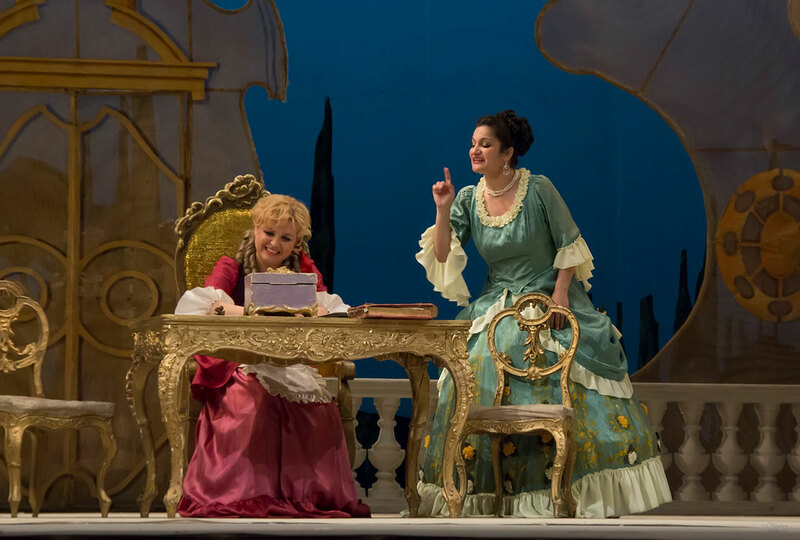 Marcellina warns Susanna that Figaro is already in the garden. That suits Susanna just fine, as she can avenge herself on both Figaro for his jealousy and the Count for his philandering. Marcellina retires into the pavilion. The Countess is too nervous to remain, but allows Susanna to stay for a bit to enjoy the breezes. Susanna sings a love song to an unnamed lover to punish the spying Figaro ("Deh, vieni, non tardar, o gioia bella"). Then she hides nearby and puts on the Countess's cloak. Figaro is furious, but he continues to lie in wait. Cherubino arrives, looking for Barbarina, who has meanwhile hidden herself in the pavilion. At the same time, the Countess enters, disguised as Susanna. Cherubino, not realizing who she really is, begins flirting with her. The Count comes in and receives the kiss meant for "Susanna." The Count slaps Cherubino for his impudence, and the boy flees into the pavilion. Now the Count does some flirting of his own with "Susanna", infuriating Figaro further. 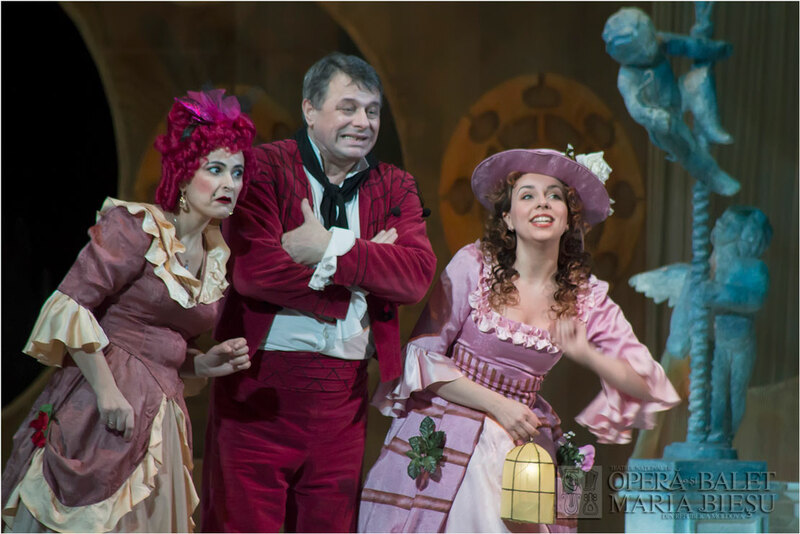 The Count tries to lure her into the dark pavilion, but, hearing Figaro's voice and fearing discovery, tells "Susanna" to go ahead into the pavilion without him. He exits, promising to meet her later. Now the real Susanna arrives, disguised as the Countess. When Figaro hears her voice, he immediately realizes that she is Susanna. He pretends to court "the Countess." Susanna is furious until he reveals his joke, and they tenderly reconcile. When the Count returns, the couple replay the joke. The enraged Count seizes Figaro and calls for weapons. 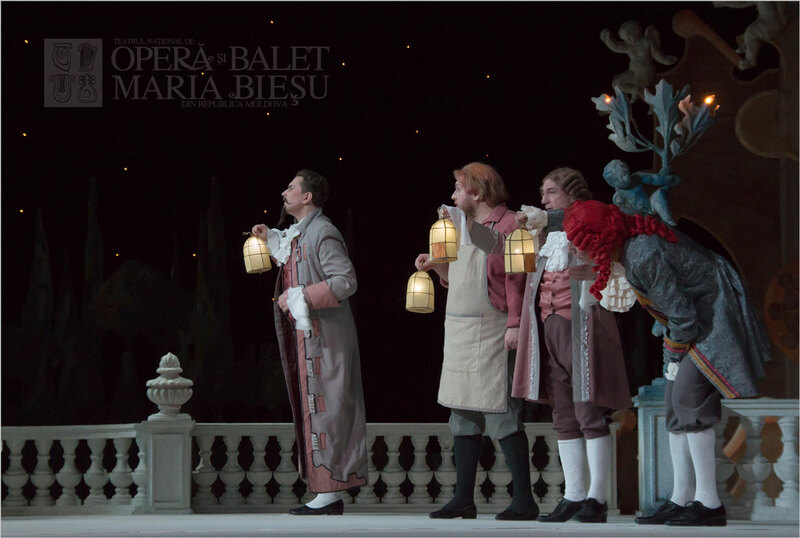 Susanna flees into the pavilion as Bartolo, Basilio, Antonio, and Curzio rush in. The Count demands that his wife come out of the pavilion. To everyone's amazement, out pop Cherubino, Barbarina, Marcellina, and Susanna, still dressed as the Countess. She and Figaro pretend to beg the Count's forgiveness. He is adamant until the real Countess reveals herself. The chastened Count humbly asks her pardon, she grants it, and everyone rejoices. based on a stage comedy by Pierre Beaumarchais: "La folle journée, ou le Mariage de Figaro"
World Premiere: May 1, 1786, at Burgtheater in Vienna. Premiere in Chisinau: November 5, 1995, at National Theatre of Opera and Ballet in Republic of Moldova.